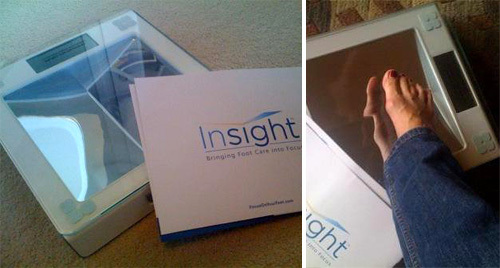 Insight Foot Care Scale Allows Diabetics To Check The Health Of Their Feet | OhGizmo! Amy Tenderich over at Diabetes Mine recently reviewed a unique scale specifically designed for those living with diabetes. Now there’s nothing particularly high-tech about the Insight Foot Care Scale besides an oversized and easy-to-read LCD display, but what makes it useful for diabetics is a unique illuminated mirroring system that makes checking the health of their feet a lot easier. Particularly for the elderly. The scale can support and weigh persons up to 400 pounds, and includes something called ‘Cue Light Technology’ which reminds users to check their feet on a daily basis. According to the Insight website there are over 75,000 amputations every year in the US among diabetics, and half of them could have been avoided with proper foot care. So while the Foot Care Scale isn’t cheap at $99.99, it could definitely be considered one of those worthwhile splurges. Glucophage (metformin) for Polycystic Ovary Syndrome: Have been suffering for 18 years before someone decided to treat me. Glucophage plus a birth control has made life better. According to the Insight website there are over 75,000 amputations every year in the US among diabetics, ………….